Small organizations bring heart. Large organizations bring credibility. Collaborate! Librarians and journalists share common cause for engaging the public in civic life. In the digital age, news and information will look as different from newspapers, TV, and radio news, as these innovations did when pre-printing press, news was delivered from the pulpit. Think investigative journalism delivered via hip hop and video games. 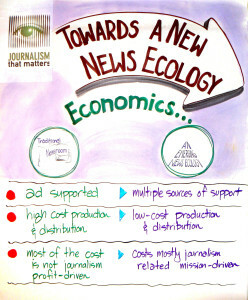 * Worked at the emerging edge of the new news ecology. Stephen, Chris and I created a plan. We were subsequently joined by Bill Densmore, of the Media Giraffe Project. While it has unfolded completely differently, Journalism that Matters has convened twelve conversations among more than 800 people from the evolving ecosystem of journalism. Since we began, technology has radically altered the nature of our communications. The Internet enables anyone to publish, shaking old assumptions of who is a journalist and what constitutes journalism. Social networking technologies such as Facebook ushered in an age of many-to-many connecting. We no longer depend on a few publishers and broadcasters to set the collective agenda. More than passive recipients of information, we are now active participants shaping our cultural narrative. For generations, newspapers — and then television — gave us the news, telling us what needed our attention. As we became “consumers” of news, the stories began to change, no longer providing what we needed to know as citizens. Perhaps, this, as much as changing technology, has created a generation that finds no connection between journalism and democracy. For many under 40, the information they need to be engaged citizens does not come through traditional journalism. As aggregators like Google News use algorithms for choosing what stories matter, our cultural narrative arises from what we collectively follow. So newspaper circulation and ad revenues decline, and broadcast news viewers age (think ads for Viagra and Boniva for bone loss). Does this decline threaten the health of democracy? Or has journalism as we know it passed its time? * how it is financed. If journalism’s old story was to provide people with information they needed to be free and self-governing, in the emerging story, journalism not only informs, but engages, inspires, and activates people to play their roles as free and self-governing citizens. I was in the Middle East talking with a Palestinian about frustrating, polarizing material. He kept repeating the same ideas over and over so I asked that magic question: “given what’s happening, what’s possible now?” It shifted the interview completely, as our contact began envisioning the situation in a completely new way. By adding “What’s possible now” to the traditional five “W’s” of journalism – who, what, when, where, why, and how — stories call forth hopes and aspirations. At JTM-Washington, DC (www.mediagiraffe.org/wiki/index.php/Jtm-dc) there were fierce conversations between long-time journalists and newcomers. One journalist had a change of heart about “citizen journalists” when their conversations made clear that the primary difference between pros and serious amateurs were (1) who gets paid; and (2) professionals COVER stories, citizens SHARE THEIR stories. Journalists are no longer gatekeepers to the stories that matter, though many have been so busy guarding the gate that they have not noticed the fence is gone. Still, with the vast increase of sources, the role of making sense of a complex and rapidly changing world is more vital than ever. And the range of options for receiving and making sense of news has exploded, becoming more confusing in the process. Traditional sources — newspapers, television, and radio — are supplemented by blogs, video blogs, and Internet radio. Sense-making often occurs through conversation, as social networking sites and local platforms for civil discourse support fact-checking and collective meaning-making. 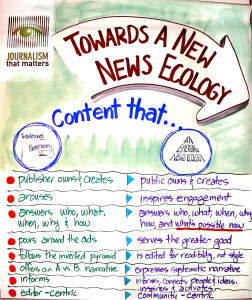 For JTM-Silicon Valley (www.newstools2008.org), which brought together journalists and technologists, two maps were created: 1) the primary roles in a traditional newsroom and 2) a preliminary sketch of emerging roles. 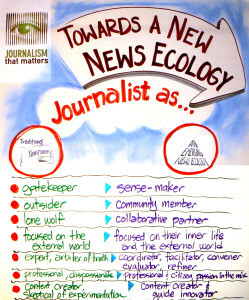 We began the emerging news ecology map with three roles: community, beat blogger, and sense-maker. Given the growing emphasis on conversation, “community weavers” skilled at hosting civil online (e.g., www.westseattleblog.com) and face-to-face conversations were soon added. These roles are clearly just the beginning. Virtually every aspect of journalistic practice is changing, with self-publishing, 7×24 coverage, social networking, crowd-sourcing, Twitter, blogs, mainstream outlets, and more. Multi-media reporting skills become essential as stories are distributed via computers, cell phones, and iPods. As distribution goes “high tech”, sourcing stories goes “high touch”. Public radio’s Public Insight Journalism engages ordinary people to cover news in greater depth and uncover stories not otherwise found (www.americanpublicmedia.publicradio.org/publicinsightjournalism). No longer are events the only trigger for a story. For example, JTM alum, Ilona Meagher (www.niu.edu/PubAffairs/RELEASES/2007/aug/ilona.shtml), unexpectedly found herself an expert on Post Traumatic Stress Disorder because she started writing about the interconnections she uncovered by researching a subject important to her. Now she is in journalism school, learning the craft that adopted her. More people are involved in telling stories today. Tapping into networks of bloggers to bring complex stories into focus as “beat bloggers” (www.beatblogging.org) do, journalists move from outside the system to being key connectors within a system. * the art of engagement – convening community both online and face to face. How do we engage an increasingly diverse audience? And how do we ensure investigative journalism – community, national, international – is done well? How can journalism inform, engage, inspire, and activate us — materially, intellectually, emotionally, and spiritually — to be free and self-governing citizens and communities? Kovach, Bill and Tom Rosenstiel, The Elements of Journalism. Crown Publishers, New York, 2001, p. 12. Thanks to Steven Wright for the visual recording.